The Wizards run away from the Wolves 109-95 behind 23 points off the bench from Rasual Butler and another terrific game from John Wall who had 21 points and 17 assists. The 17 assists match his career high which he set just eight days ago against the Boston Celtics. Unlike in previous games against inferior opponents, the Wizards came out hot hitting on 4-6 field goals to start the game. John Wall assisted on the Wizards first four buckets and had 6 assists in the period. The Polish Hammer also started out hot connecting on four of his first six shots from the field and eight points in the quarter. Otto Porter got the first start of his young NBA career due to a sore toe for Paul Pierce. I’m not sure how severe the injury is or if this was just precautionary. Regardless, the Wizards felt they didn’t need The Truth to take down an inferior Wolves team who was already decimated with injuries. The bench came in in the 2nd quarter and was very solid. They were able to keep the lead in the 8-12 range for pretty much the duration of the quarter. It was interesting to see that the Wolves opted to double the post off of Andre Miller’s man. When the Wizards bigs passed out of the double team, this led Andre Miller to shoot wide open threes which isn’t his game whatsoever. There was a possession where the professor went up for a put back dunk but got stuffed by the rim. Love the guy but let’s stick to post ups. The third quarter was the Wolves’, mainly Thaddeus Young’s to shine. Young scored 19 of his 29 points in the 3rd quarter and was really the only reason the Wolves were in this game. His jump shot was on tonight as evidenced by his 12-19 shooting from the floor. If he would have hit his free throws, it would have made the game that much more interesting. But he shot a poor 5-12 from the charity stripe. The Wiz blew this game open in the 4th due to some hot shooting from the bench, specifically Rasual Buter. Rasual scored the first six points of the quarter for the Wizards and had 18 in the quarter including two threes. At the 6:01 mark in the 4th quarter, the Wizards had already scored 19 points on 9-10 shooting; all from bench players. As mentioned, Rasual hit a three from the right corner to stretch the lead to 16 at the four minute mark and the Wizards never looked back. 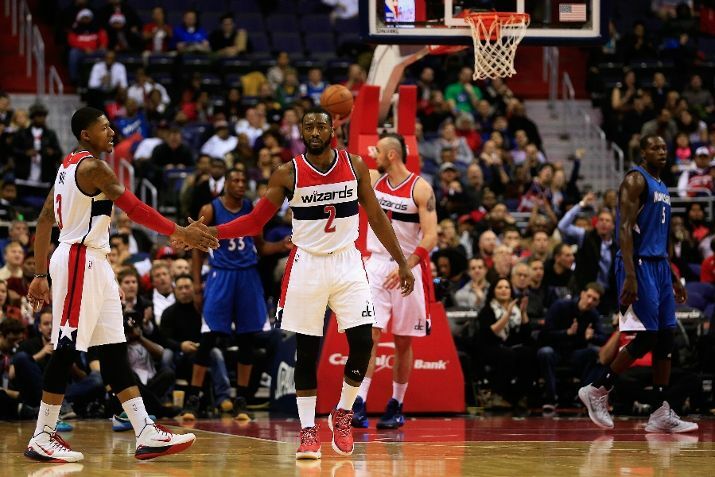 The Wiz are 18-6, one win away from matching their best start in franchise history. The Wiz will be seeking revenge in south beach this Friday. Notes: With John Wall’s ridiculous stat line once again, the crowd started “MVP MVP MVP” chants when he was at the line. There’s still 2/3 of the season to go but if John continues to play at this high level, no reason not to include him in the MVP discussion. Also, the last man to make the roster, Rasual Butler, should also be getting some recognition here soon as potential 6th man of the year. Once again though, still a lot of basketball to be played.